Buckeye Fire Equipment is an American based, privately owned and operated company that specializes in the development and manufacture of highest quality fire protection equipment. Their headquarters is near Charlotte, NC and their products are sold worldwide. The quality and reliability of their fire protection products, and their dedication to customer service has earned them a reputation that has helped propel them to the forefront of the fire protection industry. Because of this demonstrated commitment to high standards in customer service and technical support, Buckeye Fire Equipment earned the highly coveted ISO 9001:2008 Quality Certification. Buckeye designs, machines, and assembles their component parts and then subjects them to the most extensive and rigorous in-house product testing for highest quality standards. In addition, their products under go third party testing by various organizations including the U.S. Government, Underwriters Laboratories, U.L. Canada, Factory Mutual, and ASME. Buckeye’s fire protection products include a complete line of commercial and industrial handheld and wheeled fire extinguishers, extinguishing agents, fire suppressing foam concentrates and hardware pre-engineered kitchen suppression systems. 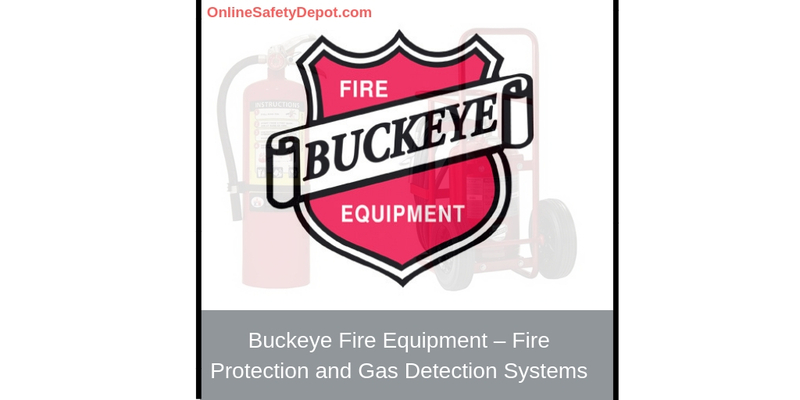 One of the signature products of Buckeye Fire Equipment is its impressive line of Hand-held Fire Extinguishers. The hand-held fire extinguisher is the fire protection equipment of choice for homes, offices, schools, public facilities, vehicles, boats, and any other structure that could be threatened by fire. Buckeye’s line of Offshore Fire Extinguishers also includes hand-held models. The Buckeye line of fire extinguishers encompasses all the fire classification categories (Class A, B, C, D, and K fires) with the appropriate extinguishing agent most effective against specific types of fire. Various canister sizes and flow rates are available. Recharge capability. The durability of Buckeye’s canisters and valve assembly enable the spent extinguishers to be recharged for continued use. Protection from the rough use and environmental exposures. Anodized metal and brass assemblies of industrial grade steel and aluminum cylinders provide superior durability against the roughest use, and the polyester powder coating provides protection against the harshest environments where heat, moisture, and winds can combine to corrode materials without the protective features. Durability and extended use life. Metal pull pins, wall mounts, vehicle brackets provided protections for longer lasting use. At-a-glance color coded gauges. Provide the user with the operating status or readiness for use in fighting a fire. Bilingual instructions. Information about the operating and maintenance requirements in English and Spanish, and English and French. Easy maintenance history. Each extinguisher has a model and serial number bar coding to track the history of the use and maintenance of the extinguisher. Ease of use. Despite their larger size and heavier weight, wheeled fire extinguishers are designed to be operated by a single person. They are built with a broad and sturdy base of support, come with semi pneumatic tires or larger diameter steel wheels, and a uniquely balanced weight distribution enable them to be transported rapidly and effectively down corridors, around corners and over rough terrain. Durable steel cylinder and wheeled model frame. Each is treated with a galvanizing compound undercoat, baked on enamel top coat, and protective clear coat finish to prevent corrosion and fading from long-term exposure to sunlight and the water and salt of the sea. Assembly valve construction. Built with stainless steel operating levers, plated brass valves, and plated brass guard around pressure gauges for protection against rough use and corrosion unique to offshore conditions. Rigorous testing. All components of the extinguishers are tested and must pass a 3000-hour salt spray test as part of quality assurance guidelines. UV resistant lamination. All unit nameplate labels are protected with UV resistant lamination to protect against sun damage. Added protection. A plated brass guard protects the pressure gauge. Highest standards. All products meet DOT and Transport Canada requirements. High fire ratings. UL and ULC listed with same high fire ratings. Purple K chemical. An agent effective in extinguishing Class B flammable liquid fires and also effective in fighting class C fires associated with energized electrical equipment. State-of-the-art BFT-44 and BFT-48 sensor transmitters support single or dual sensor inputs for greater dual sensing in real-time situations, and transition of data locally or to a receiver in another location. Buckeye Detection Systems offer both wired and wireless controllers, with customizable input and output options, for small to mid-size site detection level monitoring and alarm. The controllers accept direct LEL inputs as well as digital, analog and discrete relay connections. The Buckeye Detection Systems Wireless Monitoring Network (BDSNET) is a battery powered wireless transmitter (and a least one 32 channel wireless receiver) that allows remote HMI functionality via a web enabled device, giving responders the ability to view “live data” as well as historical data, on smart phones or tablets, prior to entering a hazardous area. The transmitter is compatible with existing BFT-48 systems, and features power On/Off via magnetic wand, dual gas sensor capability, and easy battery replacement for rapid and easy deployment for both temporary and permanent monitoring applications. Buckeye Detection Systems Calibration Kit’s come in a durable and convenient plastic carrying case. The kit utilizes an “Eco-Friendly” refillable 58L span gas, 58L Eco-smart refillable zero air, regulator, and 3’ Teflon tubing.